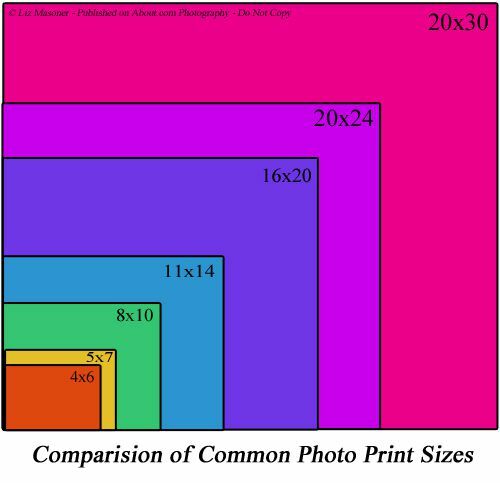 The print sizes we know today as common photo print sizes developed based on negative sizes. Prints were made by enlarging the image from the negative without cropping. As negative sizes changed, so did print sizes. Medium format and 35mm format negatives are the two most influential negatives in creating our current common photo print sizes. The illustration above shows the relative sizes of common photo prints when compared to each other. As you can see, some photo print sizes are much more similar than others. For example, 4x6 and 5x7 are very close to each other in size and ratio while 20x24 and 20x30 are much more different from each other.